Spirituality.org - August 2011 - From The Cross With Love: Seven Words To Live By, George Olivera, OFM Cap. By George Olivera, OFM Cap. The Cross of Christ is the threshold where the broken heart of God embraces the broken heart of man. There is no other way to God. No technique, no method, can replace the Cross. Whenever we set out to do something beautiful for God, whenever we try to love to the end, we must go by the way of the Cross. Only when we have spent ourselves for the Lord and for those He has entrusted to us do we begin to taste this mystery. Here, the limits of our humanity meets the limitlessness of God. According to John Stott the Christian community is a community of the cross, for it has been brought into being by the cross, and the focus of its worship is the Lamb once slain, now glorified. So the community of the cross is a community of celebration, a Eucharistic community, ceaselessly offering to God through Christ the sacrifice of our praise and thanksgiving. The Christian life is an unending festival. And the festival we keep, now that our Passover Lamb has been sacrificed for us, is a joyful celebration of his sacrifice, together with a spiritual feasting upon it. St. Paul, presents the Scandal of the Cross to the Church at Corinth (1 Cor. 1:18-25): "The message of the cross is complete absurdity to those who are headed for ruin, but to us who are experiencing salvation it is the power of God... Yes, Jews demand 'signs' and Greeks look for 'wisdom,' but we preach Christ crucified — a stumbling block to Jews, and an absurdity to Gentiles; but to those who are called, Jews and Greeks alike, Christ the power of God and the wisdom of God. For God's folly is wiser than men, and His weakness more powerful than men." For a Jew Cross was never a blessing, for the Greeks the Cross was an insult to humanity and for Cicero would articulate for the Romans: let not the shadow of the Cross fall on the Romans. Personal experience as a teacher of the Gospel of Christ made St. Paul keenly aware that the cross of our Redeemer was a "stumbling block" (skandalon in Greek) for most of his listeners. They were "scandalized" by the horrific suffering and violent death of Jesus of Nazareth, and even more "scandalized" by Jesus' words (Mk. 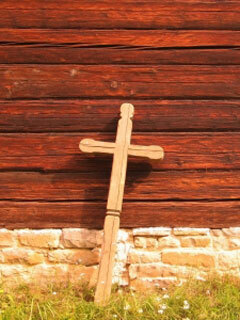 8:34-35), "If a man wishes to come after me, he must deny his very self, take up his cross, and follow in My steps. Whoever would preserve his life will lose it, but whoever loses his life for My sake and the Gospel's will preserve it." For us Christians and Religious the Mystery of the Cross is the life, the Resurrection and the Eternal Life. In the celebration of all-pervading Silence of the Abba Father, Jesus speaks from the Cross with love to his hearers. Father, forgive them, for they know not what they do. Lk. : 23:34. Here we have the theology of forgiveness. St. Ambrose commenting on the Book of Genesis states: I have read God created light on the first day and not rested. The next days he created the earth and sky, earth and the waters, birds and trees and not rested. But on the sixth day he created man and woman, then he rested because he had someone to forgive. God's primary language is forgiveness, therefore the saying: To err is human, to forgive is divine. No one can forgive except God. Jesus the Logos of the Father has said we need to forgive each other daily as God would forgives us daily. According to William Temple: Only one petition in the Lord's prayer has any condition attached to it; it is the petition for forgiveness. Corrie ten Boom told of not being able to forget a wrong that had been done to her. She had forgiven the person, but she kept rehashing the incident and so couldn't sleep. Finally Corrie cried out to God for help in putting the problem to reSt. "His help came in the form of a kindly Lutheran pastor," Corrie wrote, "to whom I confessed my failure after two sleepless weeks." "Up in the church tower," he said, nodding out the window, "is a bell which is rung by pulling on a rope. But you know what? After the sexton lets go of the rope, the bell keeps on swinging. First ding, then dong. Slower and slower until there's a final dong and it stops. I believe the same thing is true of forgiveness. When we forgive, we take our hand off the rope. But if we've been tugging at our grievances for a long time, we mustn't be surprised if the old angry thoughts keep coming for a while. They're just the ding-dongs of the old bell slowing down." "And so it proved to be. There were a few more midnight reverberations, a couple of dings when the subject came up in my conversations, but the force – which was my willingness in the matter – had gone out of them. They came less and less often and at the last stopped altogether: we can trust God not only above our emotions, but also above our thoughts." Forgiveness is the very heart of Christianity. From the heart of God forgiveness flows and passes through the hearts of humanity. According to St. Bernard: When Christ's hands were nailed to the cross, he also nailed your sins to the Cross. Humanity is never so beautiful as when praying for forgiveness and showing willingness to forgive another. So we see Jesus forgiving the aggressors from the Cross: Father forgive them for they know not what they do. Similarly St. Stephen the disciple prayed for forgiveness for those who stoned him to death. Father forgive them for they do not know what they do. Gladys Staines forgave the killers who killed her husband Graham and her son Timothy in Orissa, India. St. Augustine says: Two works of mercy set a man free; forgive and you will be forgiven, and give and you will receive. According to Thomas Fuller: He that cannot forgive others breaks the bridge over which he must pass himself; for every man has need to be forgiven. "Gandhi was right: if we all live by 'an eye for an eye' the whole world will be blind. The only way out is forgiveness." This day shall you be with me in Paradise. Lk. : 23:42-43. Words of Assurance: God is our blessed assurance and Jesus is our Saviour. Every saint has a sinful past but every sinner has a blessed future. Jesus is our Blessed Assurance. In our pilgrimage, when we are in doubt, when we are depressed, when we are encircled in the circle of loneliness, when we targeted by our sinful tendencies – Just a glance at the cross of Jesus could remind us of his divine assurance, Surely you will be in paradise forever and ever. Frances J. Crosby, 1873 composed a beautiful hymn on divine assurance: Blessed assurance, Jesus is mine! Oh, what a foretaste of glory divine! Heir of salvation, purchase of God, Born of His Spirit, washed in His blood. Blessed Assurance is ours only when we build our life around God. David Oman McKay reminds us: Each one of us is the architect of his own fate; and he is unfortunate indeed who will try to build himself without the inspiration of God, without realizing that he grows from within, not from without. According to Paul L. McKay: Cynics build no bridges; they make no discoveries; no gaps are spanned by them. Cynics may pride themselves in being realistic in their approach, but progress and the onward march of Christian civilization demand an inspiration and motivation that cynicism never affords. If we want progress we must take the forward look. Behold your Son; Behold your Mother. Jn. : 19:26-27. Love does these things. Love gives selflessly without counting the coSt. Jesus gave to us His dearest Mother at the moment when he uttered these words. There is your Mother. By giving His Mother, Jesus has given us a glorious sign for our pilgrimage. Mary is our Blessed Hope to cling on as we walk along in the pilgrimage of faith towards the house of God our Father. Princess Elizabeth said long ago: Blessed are those who can give without remembering, and take without forgetting. Wilfred A. Peterson succinctly list the art of Giving: We give of ourselves when we give gifts of the heart: Love, kindness, joy, understanding, sympathy, tolerance, and forgiveness. We give of ourselves when we give gifts of the mind: Ideas, dreams, purposes, ideals, principles, plans, projects, poetry. We give of ourselves when we give gifts of the spirit: Prayer, vision, beauty, aspiration, peace, faith. We give of ourselves when we give the gift of words: Encouragement, inspiration, guidance. Mother Teresa used remind her sisters: Every time you smile at someone, it is an action of love, a gift to that person, a beautiful thing. Let us always meet each other with smile, for the smile is the beginning of love. The sea of Galilee and the Dead Sea receiving the waters from the same source, Mount Hermon yield opposite results. The sea of Galilee having an outlet for its water irrigates the plain of Jordan and fertilizes it, whereas the Dead sea lacking an outlet retains the waters in itself and cannot give life but only death appropriate to its name. Receiving, therefore, and giving makes all the difference in the world. Interestingly, unselfish and selfish people act much the same way. Unselfish people get to give and grow in their generosity while selfish people only get to retain and thus stagnate into desolation. My God! My God! Why have you forsaken me? Mk. : 15:34-35. The obedient servant of Yahweh is totally dependent on the mercy of God.But the heavenly father is silent, while witnessing the total sacrificial obedience of the Son. Our life is totally helpless and powerless, when we are totally dependent and obedient to the will of God. This total kenosis cannot be experienced without the grace of the Holy Spirit. It is given to only for a few select few friends of God. Henri Nouwen mentions about terrible dryness in our spiritual life: Sometimes we experience a terrible dryness in our spiritual life. We feel no desire to pray, don't experience God's presence, get bored with worship services, and even think that everything we ever believed about God, Jesus, and the Holy Spirit is little more than a childhood fairy tale. Then it is important to realize that most of these feelings and thoughts are just feelings and thoughts, and that the Spirit of God dwells beyond our feelings and thoughts. It is a great grace to be able to experience God's presence in our feelings and thoughts, but when we don't, it does not mean that God is absent. It often means that God is calling us to a greater faithfulness. It is precisely in times of spiritual dryness that we must hold on to our spiritual discipline so that we can grow into new intimacy with God. St. John of the Cross describes desolation thus: "Desolation is a file, and the endurance of darkness is preparation for great light." Vincent van Gogh presents the state of desolation in this manner: "It always strikes me, and it is very peculiar, that when we see the image of indescribable and unutterable desolation - of loneliness, of poverty and misery, the end of all things, or their extreme – then rises in our mind the thought of God." Religious life is a never ending thirst for God and a longing to be in a community. Consecrated persons are those who long for God and long to e in fellowship in the community. This thirst is two dimensional. In the vertical dimension, it has God for its focus. This thirst is an openness for God, openness to His Word, openness for his divine presence. This thirst has also a horizontal dimension: the thirst for/to belong to a community. The community of believers, the community of the faithful. St. Augustine starts his Confession affirming his longing for God: "Thou hast made us for Thyself O God, and the heart of man is restless until it finds its rest in Thee." For Blaise Pascal this longing is not the matter of reason, but a matter of the heart: It is the heart which experiences God, and not the reason. This, then, is faith: God felt by the heart, not by the reason. During the funeral service of Mother Teresa her life motto: "I Thirst." was displayed in a big banner in the Stadium where her body was laid for public viewing. Billions of people viewed this Banner in TV screens around the Globe. Surely her thirst souls for Jesus was life motto and life mission. And she succeeded in her life motto during her life time and also at her death. Words of fulfillment: It is consummated. Jn. 19:30. In the Old Testament all the prophecies were foretold of Jesus and in the New Testament all these prophecies are fulfilled in Jesus. We as the Christians and religious stand on the promises of God. It is in his gracious time all the promises made to us would be fulfilled. For Matin Heidegger death is the most authentic moment of human existence and human fulfillment. Similar sentiments have been documented by Dag Hammarskjold when he says: Do not seek death. Death will find you. But seek the road which makes death a fulfillment. Victor Frankl the author of the Search for Meaning stresses that each has a mission in life: Everyone has his own specific vocation or mission in life; everyone must carry out a concrete assignment that demands fulfillment. Therein he cannot be replaced, nor can his life be repeated, thus, everyone's task is unique as his specific opportunity. An Arabian proverb presents in a figurative manner: A promise is a cloud; fulfillment is rain. Stephen R. Covey outlines our life has a hierarchy of needs and fulfillment. "There are certain things that are fundamental to human fulfillment. The essence of these needs is captured in the phrase 'to live, to love, to learn, to leave a legacy'. The need to live is our physical need for such things as food, clothing, shelter, economic well-being, health. The need to love is our social need to relate to other people, to belong, to love and to be loved. The need to learn is our mental need to develop and to grow. And the need to leave a legacy is our spiritual need to have a sense of meaning, purpose, personal congruence, and contribution" Erich Fromm suggests our ideals and purposes are not outside of ourselves but within our inner reach: "As long as anyone believes that his ideal and purpose is outside him, that it is above the clouds, in the past or in the future, he will go outside himself and seek fulfillment where it cannot be found. He will look for solutions and answers at every point except where they can be found –in himself." Father, Into your hands I commend my Spirit. Jn. 23:46. Every pious Jew ought to say this prayer before retiring to bed for the night. Most probably this prayer was taught by Mother Mary to Baby Jesus at his infancy. The same prayer became Jesus last prayer to Abba Father before he breathed his last. Commenting on these words Archbishop Fulton Sheen says: "The egocentric is always frustrated, simply because the condition of self-perfection is self-surrender. There must be a willingness to die to the lower part of self, before there can be a birth to the nobler." Our life is life of self-surrender William Penn penned these verses in the 17th century: No pain, no palm; no thorns, no throne; no gall, no glory; no cross, no crown. Doing the will of God is our unique beatitude in life and in death. As Adelaide Pollard prays: Have thine own way, Lord, have thine own way! hold o'er my being absolute sway. Fill with thy Spirit, till all shall see Christ only, always, living in me. "Have Thine Own Way". St. John of Cross reminds us: At the end of our life, we shall all be judged by charity. These unique words of Jesus from the Cross invites a person response from every Christian. Here is a sample of my response to the words of Jesus from the Cross. For the Words of Forgiveness: Father, forgive them, for they know not what they do. My Response is Lord You are My Forgiveness. For the Words of Assurance: This day shall you be with me in Paradise. My Response is Lord you are my blessed Assurance. For the Words of Offering/giving: Behold your Son; Behold your Mother. My Response is Lord, You are My Friend. For the Words of desolation: My God! My God! Why have you forsaken me? My Response is Lord you are my Solitude. For the Words of Longing: I Thirst. My Response is Lord You are my Shepherd. For the Words of fulfillment: It is consummated. My Response is You are my God and you are my All. For the Words of Self-Surrender: Father, Into your hands I commend my Spirit. My Response is Lord, You are my Beatitude.